They are a 4" outside diameter. The template and instructions from the projects file made it easy. I have already made 3 more. The first one though, I cut using a 1/32" bit, no problem. The next ones I tried, ended up breaking the 1/32, and I had to switch to 1/16". They are not quite as crisp, but still look good. I am going to try a bit somewhere in between the two. All finished. 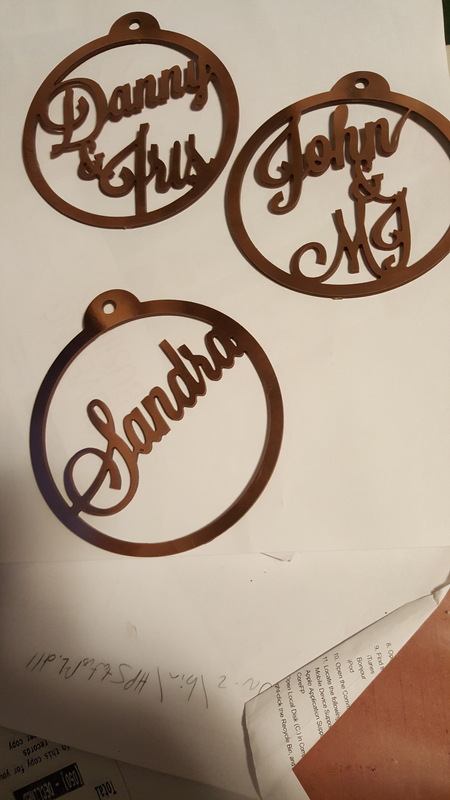 Hopefully the grandkids will like them. That is so thoughtful you made one for me! I’ll PM you my address. So many people spell Bryan the wrong way it’s great to see it with the Y ! I’m new to this and trying to find out what wood I should be using and where to find it. I know any sturdy, thin, material should do the trick… though input from the pros would be great! I called around to specialty stores and nobody has 1/16 pine on hand or anything like that. Thank you for the help! 1/8" birch plywood works well. In fact, most any thin plywood will work. I made a few from pieces of scrap wall paneling. hi Tom… I own a sawmill business so I always have wood lying around. My process is I resaw 4/4 Maple, Arbutus or whatever else I have in the shop down on the bandsaw. Then I run it through my thickness sander down to 3/16” or less. I also use 6mm Baltic birch plywood, hope this helps you. 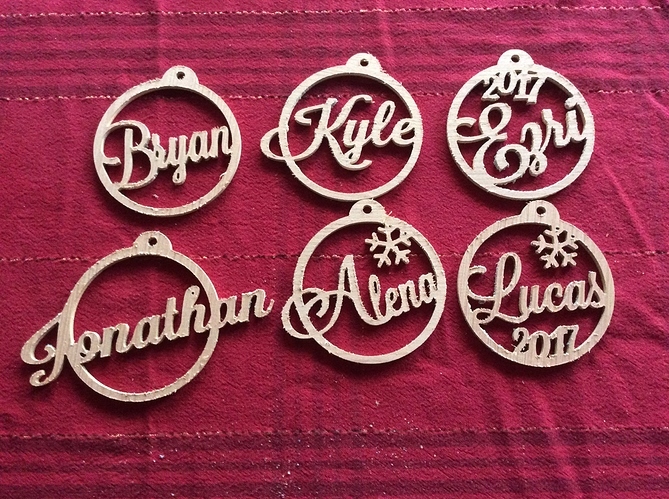 1/8" to 1/4" MDF works fantastic for these. I’d probably go with the thinner 1/8" though. I did it! I agree with the others, not easy or fast. Lol! Pretty proud of my work though! Tried again with the same settings and material and failed. Still struggling with doublesided tape vs clamps. A video on that would be amazing! Please try the Tape and Glue method explained above. It works extremely well. And, with careful setup, the two layers of tape and the glue add enough additional thickness which allows you to cut all the way through your piece but not into the waste board. I mention this because it holding power is dependent on having good contact with both the work piece (not usually a problem) AND the waste board. If your waste board is cut up a bunch it can reduce the holding power which can be a problem with more aggressive cuts. Every now and then I fill the errant cuts with wood-filler and sand smooth. It is easier than re-facing the entire waste board to repair a few cuts in the lower left corner. OK, 20 ipm BUT what size bit and how deep are you cutting? A successful cut needs all three of these to be sync. How are they set? The .03 is what you would be using for a 1/16" bit you should have it down around .015 and with that small of a bit your plunge and feed might be a bit fast. Not sure on those i try to stay away from that small of bit they break to easy. I have two 1/32" bit but honestly, have never tried to use them. Just look way too frail but hey, that’s just me! I will say if using a bit that small there is no way a wrong setting will cause it to lose steps and run off. My best guess is either something is too loose or too tight. Are all the belts tight? To be certain there are methods using a fish or small baggage scale to measure the tautness. A search should yield the process. If that’s OK then with all the power off, try moving it by hand on both the x and y axis. There should be a little resistance but not a lot. If it is stiff V-wheels somewhere are too tight. Adjust accordingly. BTW - If someone screams “DON’T MOVE IT BY HAND” because you will fry the controller - please ignore them. I guess theoretically this might be a possibility but I have yet to see a documented case. I and many others do it all the time with no ill effects. As a precaution, don’t get over aggressive and shove it around fast. But my experience of doing to a hundred plus times has shown slow movement will not cause a problem. 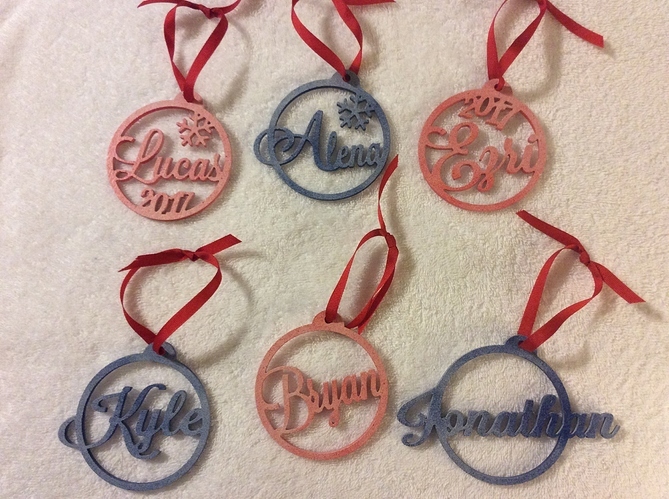 We made about 25 ornaments this year as gifts for family, coworkers, and friends. The gold glitter acrylic seems to be the best on the tree (not seen in the pic). This type of support keeps me coming back to the community time and time again. Hi. Just a quick question when using the acrylic glitter and tabs. Can you tell me how you removed the tabs and make it look so perfect? The tabs seem quite thick and we used several of them so that the name wouldn’t get damaged by the vibrations. Anyway, we tried to hand saw them off with a small blade, an exact knife, hot blade, sanding and whatever else we could think of, but we can’t get them to remove cleanly. Is there a way to make the tabs thinner (for future reference)?